Everyone loves music of one kind or another. I’m big on new age jazz, upbeat classical, and hair band rock n roll. But my favorite music is definitely Irish music. There is something magical about the chords and dreams of a land across the sea. My mother was Irish — she was actually a Heinz 57 kinda gal, but I’ve pulled out the Irish in her to celebrate as my music of life. 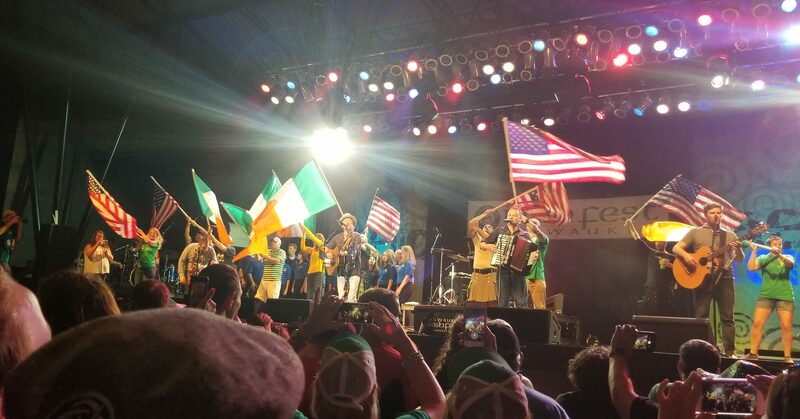 A couple of weeks ago I went to Irishfest in Milwaukee, Wisconsin, a three-and-a-half day celebration of everything Irish. But the main reason for my two day foray was the band Gaelic Storm. Now I know I’ve talked about their music before. It’s upbeat pub music, as they like to say. Lots of songs about drinking and wandering and being Irish. They were the band playing Irish music in the movie “Titanic,” but for more than a glance they weren’t part of the movie. But they’ve gained quite a following in the last 20 years, Milwaukee Irishfest being one of their promoters all these years. The crowd that Saturday night was the biggest of the fest — there must have been at least a thousand people in front of the little stage. I was three benches back — I always love to see them up close. The reason I’m talking about this group is to highlight what is magnificent about any live performance. For an hour and a half, these one- to two-thousand people sang along with every song, jumped and danced, held phone lights up in the air, and just became one dynamic force. There is something about music…live or otherwise…that transforms each of us. Live is better, for the energy bounces off every individual and onto the next. For two hours everyone is one. Country, classical, blues — it doesn’t matter. We are what God wanted us to be. We all came here from somewhere. And we’re all going to the same place in the end. Why not spend that time in between listening to music? We planted them together on these foreign shores.